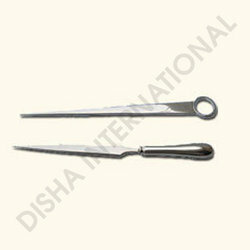 we manufacture letter openers in various sizes and shapes as per our buyer's specifications. These letter openers are made in complete Sterling silver , silver plated or with steel blades. We also make them in combination with EBONY WOOD handle. Silver goes beautiful with Ebony wood handle. Any other wood can also be used if required. As a quality-oriented organization, we are focused to provide our clients an excellent quality Sterling Silver Letter Openers that are used to open letters. Provided letter openers are manufactured by using the latest technology and quality tested silver by our dexterous professionals. According to the requirement of the clients, we offer these letter openers in various sizes and patterns. Apart from this, provided letter openers are widely demanded for their brilliant performance and customized options. We are offering customized products. 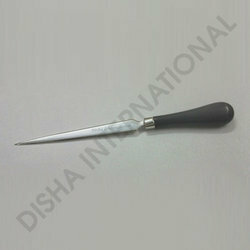 We have marked a distinct and dynamic position in the market by providing a high quality array of Silver Letter Openers with Wooden Handle that are available in various alluring designs and specifications. The offered letter openers are manufactured using fine grade silver and high tech tools under the guidance of experienced professionals. Provided letter openers are appreciated due to their attractive look and fine finish. We offer these letter openers in various customized options. We are offering customized products.